Many times as a landlord you feel as if the law favors heavily towards the tenant. California tenant/landlord law is established and enforced by the Department of Consumer Affairs, but all states have their own set of laws that regulate real estate rental agreements. You can say that there are a fair amount of sections of the law that are designed to protect the tenant, but there are also many that protect the rights of the landlord. There are some areas that come into conflict more times than others which we’ll discuss in the following article. By far this seems to be the most common point of contention between landlords and tenants. The tenant is legally obligated to leave the rented premises in the same condition as it was released to them. Granted, normal wear and tear and length of the lease is considered in the review of the conditions of the property. The landlord may legally use all or some of the tenant’s security deposit to cover issues such as unpaid rent, cost of repairing damages, cleaning, or replacing furniture in the case in which the unit was furnished. If the landlord deems necessary to go this route, he is responsible in providing detailed accounting of the funds used to restore the rental property along with receipts. This proof and any remainder of the deposit must be, by law, returned to the tenant within 21 days of the vacancy. Pro Tip: Make sure you have your ex tenant sign a waiver stating that he/she has received the statement and the remainder of the deposit and has agreed to the deductions made. Just as the landlords have a legal and moral responsibility to have the rental property “fit for the occupation of human beings,” the tenants also have a legal and moral responsibility to maintain the premises in good to excellent conditions. Landlords are also responsible to maintain common areas such as walkways, pools, gardens and social common areas up kept and clean. This also means that tenants will be held financially responsible for any negligence in their part, or in the part of any guests, family, pets or friends. Pro Tip: Make it strictly clear in your lease whether or not you have a pet policy, and the tenants’ responsibility which includes pet clean up and who is responsible for any damages caused by the pets. This can also become a huge headache, and not many people understand that the landlord reserves their right to enter a tenants’ house or apartment. The landlord, of course, needs to serve a written 24 hour notice that he will be entering the unit during normal business hours. The reasons to enter a unit may include, but is not limited to agreed up upon or necessary repairs or maintenance, the showing of the unit to future prospective tenants or buyers, any kind of emergency or a court ordered opening of the unit. The tenant needs to understand that he/she doesn’t necessarily have to be there, but it would be in the best interest of all parties involved for them to have them present, or someone who can represent them in their absence. Pro Tip: It’s important to maintain a cordial and respectful relationship with your tenants. Never go into a unit just because you want to “check things out”. This will cause trust issues, and will create further problems. These are just a few of the examples, and there are way more. The landlord must oblige to the eviction laws in his or her state. In California, for example, the eviction notice must be served in a proper manner. First, a three-day notice must be physically delivered or served in person or attached to the front door, and also sent through the postal mail service. Pro Tip: Use an experienced eviction service. It’ll save you the personal drama that may ensue from the process. 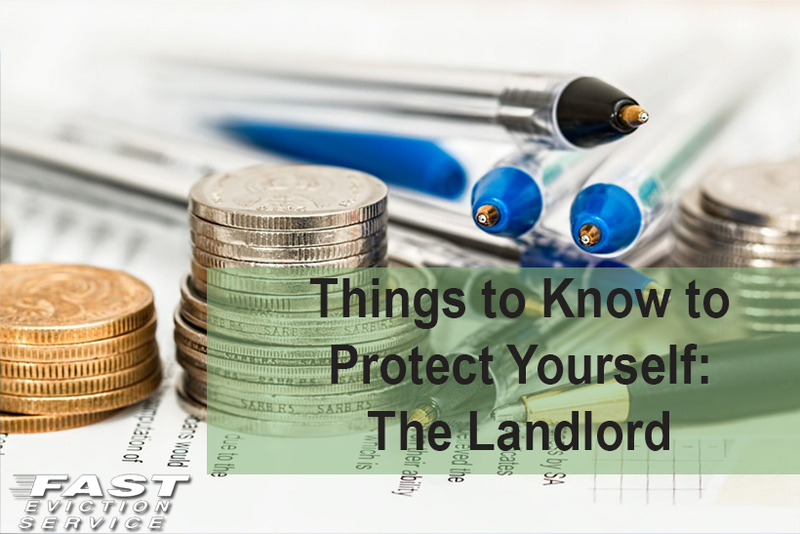 There isn’t a worse feeling than feeling alone and that the “world is out to get you.” Keep in mind that there are many laws designed to protect you: The Landlord. Nothing beats having a solid lease, and doing your part to make sure you create a positive, trusting relationship with your tenant. Closing Pro Tip: Invest in a solid lease with a lawyer. This will potentially save you a lot of money in the future, and nothing beats having a peace of mind.